The Pitch: it's Time for "Power Man & Iron Fist"! "Captain America: The First Avenger" and "X-Men: First Class" showed us the perfect way to breathe new life into the increasingly repetitive comic book movie genre - go period. Both the WWII-set adventure and the 60s-era mutant caper were successful, and their success provides the template for how to finally make "Power Man & Iron Fist" work. Set in the 70s, honey. For those who don't know, Power Man (aka Luke Cage) and Iron Fist are a pair of superheroes who decide that fighting crime is great and noble and all, but why not make a little cash doing it? Rather than just dropping in on the Avengers, these two - one a hulking badass with superhuman strength and impenetrable skin, the other a kung-fu master who can focus his "chi" into a devastating Dragon Punch - decide to set themselves up as "Heroes for Hire." Both Power Man and Iron Fist have been the subject of separate movie projects already. John Singleton was reportedly working on a Power Man film to star Tyrese (although the "Old Spice guy" Isaiah Mustafa made a passionate online bid for the role), and "G.I. Joe: The Rise of Cobra" and "The Phantom Menace" star and martial artist Ray Park was tied to an Iron Fist movie for a long time before it was scrapped. But setting these two up in the modern world is a mistake. A 70s-setting is where this wisecracking odd couple would (and did) flourish. Combining the buddy cop essence of "Starsky and Hutch" with heaping doses of blaxsploitation and kung-fu - it would be like a 70s movie mix tape more than it would be a "comic book movie." Played right, it can be like some kind of lost, unreleased Fred Williamson/Bruce Lee crossover movie. Who could direct such an epic? Clearly, someone with a firm grasp of the era's look and feel. Quentin Tarantino is almost so obvious a choice as to be dismissed, but the guy clearly loves his comic books (references to The Thing in "Reservoir Dogs," the Superman speech in "Kill Bill Vol. 2") and definitely has a feel for both blaxsploitation and kung-fu. But what about Steven Soderbergh? Check out "Haywire" or even "Ocean's Twelve" (we know, we know, but just watch it for the style) and you can see him having some fun here. And there's no way to pull off a yellow butterfly collar and a tiara in 2012, despite what "Project Runway" tells you. Throw in a funk-tastic score and you've got a cool, street-level superhero movie that defies all the usual conventions (no adolescent angst, no intergalactic threats, no earnest speechifying) and could just be what the genre is looking for. Oh, also? 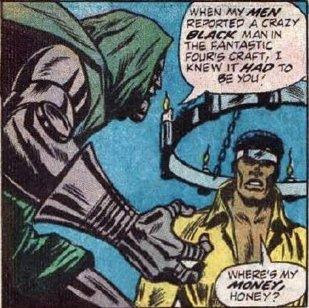 One time, Cage stole the Fantastic Four's FantastiCar and flew all the way to Europe because Dr. Doom owed him money. EXACTLY.